it's now been about a month since the electro class wound up. an ambitious, breakneck survey of the wide world of "electronic music" (broadly defined), it was a delight to teach once again, especially with students joining from as far as edinburgh and omaha. i won't be offering this particular course again, but the endeavor - and two years experience working through the materials - has deeply informed my perspective on "electronic music" and i look forward to digging into various areas, themes, and histories in new ways in other courses in future years. i suppose the biggest thing i'll take from the experience is similar to what i hope most students come away with: an enriched sense of how these various genres and styles relate to each other, sonically and socio-culturally, and how we can hear histories of social movements and cultural politics in contemporary sonic structures (especially in the way they draw musical genealogies - often in a rather audible, immediate manner). considering that we began with stockhausen and the beatles and proceeded to trace "experimental" and "popular" movements (and their interplay) in "electronic" music from the 50s to today, it seemed appropriate to end with a twin tutorial on oldschool analog synthesis and newschool max/msp from local versatile virtuoso, keith fullerton whitman (who, i should note, performs with matmos on the latest podcast from the dublab). keith gave an excellent introduction to both systems of synthesis, including showing us his max setups for both kfw and hrvatski mode - the latter requiring that one could operate it well drunk, which is, to paraphrase keith, how breakcore is supposed to be played. that there (decent but terse) wikipedia article on breakcore - see also, e.g., kid kameleon's xlr8r article - provides as good an opportunity as any to discuss the final project for the course, which required each student to create or make a substantial edit (or series of edits) to a wikipedia entry on some aspect of "electronic music" - defined as broadly as the course defined it (which is to say, broadly). my main concerns were: 1) that a wikipedia entry (or even series of entries/edits) might not quite be substantial enough for a final project; and 2) that the "neutral" POV standard of wikipedia might make it difficult for students to engage at the critical level that i would like them to, dealing not just with description and synthesis of information in their posts but also looking at how their subjects are enmeshed in certain discourses, etc., and to explore somewhat self-reflexively how their endeavors fit into the larger public conversation about electronic music. for concern #1, we adopted a slightly fuzzy "substance" standard - judged relatively across the class - to be sure that people were doing an adequate amount of independent research and original work. (it turned out to be rather helpful that one can track another wikipedian's contributions quite precisely.) for concern #2, we enforced an explicit policy of discussing the endeavor itself on our class blog and on the appropriate "talk" pages at wikipedia. finally, i'll to point people to a couple mixes that our edinburgh-based classmate put together. 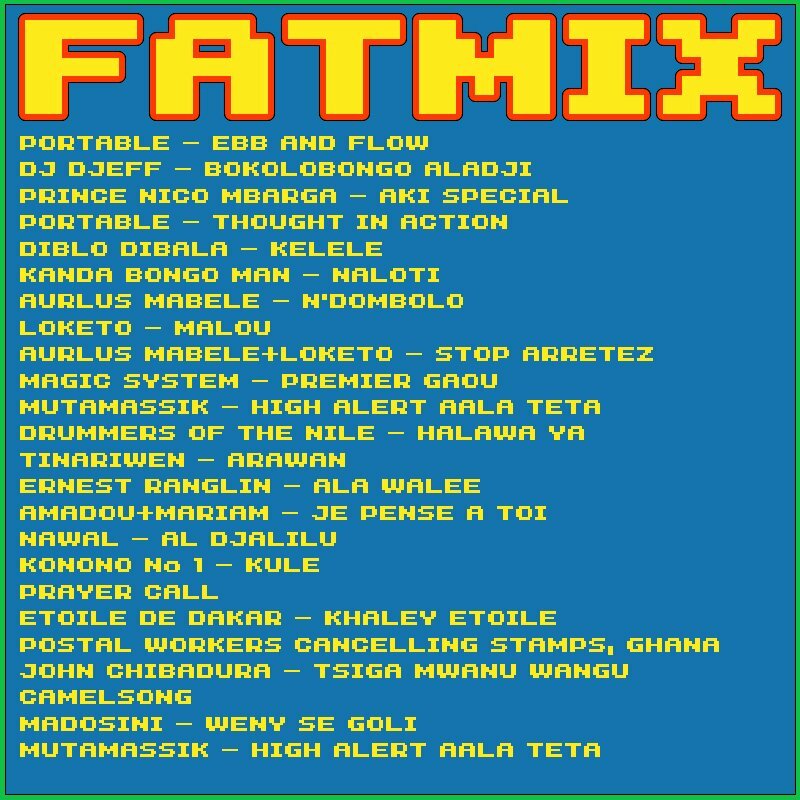 the first is an orientalist-tinged dubstep mix, the second a romp across various african popular genres. descriptions and tracklists follow..
"dubstep mix i did in ableton - LOTS of 'eastern' influence/appropriation present here!" "a mix of african tracks (from all over africa) for my dad's birthday - the end kind of lets it down but it's still very listenable ;) starts off with 20 minutes of soukous/ndombola etc style stuff then a bit more of a mixture"
I'm curious about the comments in the Orb entry about how the album lampoons prog rock pretensions, pokes fun at, etc etc. It would never have occured to me that it was anything less than sincere, and I'm wondering on what basis those conclusions were drawn. Any thoughts? no idea where that particular interpretation comes from, though your question is precisely the sort of thing that could/should be raised on the discussion page for that entry. i think the "basis" for that reading is - according to the author - the ridiculously long title, the space imagery, and the double-album length. i don't know that it's totally off-base as a reading necessarily - and it's certainly one interpretation among many - but i also don't think that the kind of lampooning alleged here need come at the expense of sincerity. the album could be doing both things at once - as when ricky lee jones's fluffy, sampled memories seem at once an ironic appropriation and a genuine expression (co-signed by the orb) of wonder at the world. the Nettle track is called 'Halfstep' from the album 'Build A Fort, Set That On Fire', released by theAgriculture in 2002.
the Nettle track is also, apparently, a bit of semi-anonymous audio information floating in the digital soup. ah, thanks for clearing that up, sr.nettl. these internets are sometimes not so forthcoming. the melonhands mixes are great, particuarly the african one. great great great. more more more. who is this mysterious melonhandman? no doubt, dm! i've been enjoying them quite a bit myself, and they've definitely been flying around the net. i'll let melon/david/jeffcapeshop know that people want to hear some more. i'm sure he'll be happy to oblige, and i'll be sure to point people to any new mixes in future posts.